Before we get into the nitty-gritty, let’s give Apple some appreciation for their incredible opening scene to the keynote. It’s not shocking that Apple managed to impress the viewers one more time. If you were first in line to grab a new iPhone X, your phone has officially been discontinued after less than a year. The good news is that its replacement, the iPhone XS, is identical in physical appearance and shares quite a few o the same features. The new iPhone XS has a few new features, but for the average consumer, they won’t have much of an impact. Apple improved features like water resistance, provided a larger storage size option of 512GB, and included Dual SIM capabilities. The camera now has Smart HDR bringing more shadow and highlight details to your photos. You can take better low-light photos with the camera’s new sensor improvements. Apple added a new feature, Depth Control, to adjust the depth of the blurred background after you shoot an image. Additionally, the camera now has faster sensors and zero shutter lag to let you stop an action shot with more detail. That’s not all! Lastly, video recording capabilities have been improved with extended dynamic range to 30fps and stereo recording. Between the iPhone XS and the iPhone XS Max, the only difference is size. Since the XS Max is physically larger Apple used a larger battery. The battery on the iPhone XS Max lasts 1 hr longer than the iPhone XS. Other than those small differences the phones are the exact same. I like to think of the iPhone XR as the skipped over and forgotten iPhone 9. 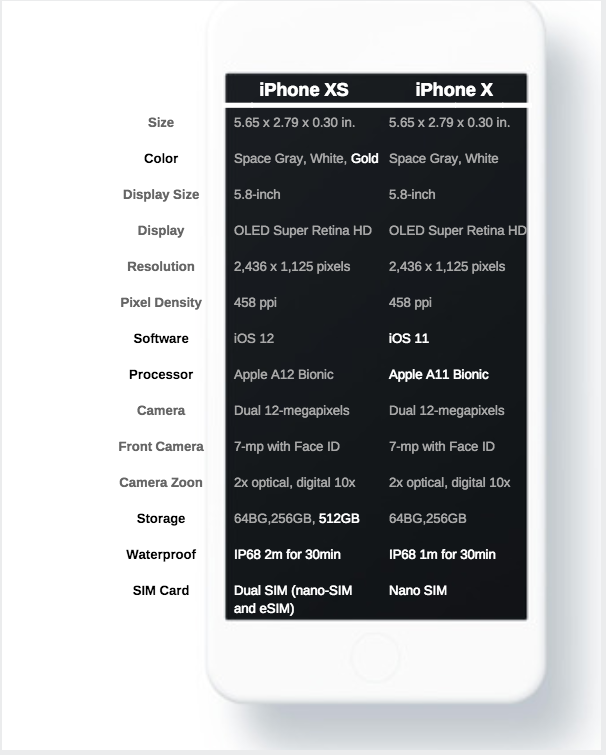 The only thing the iPhone XS and XR share is the new A12 bionic chip, other than that some features are more standard and comparable to the iPhone 8/8 Plus. 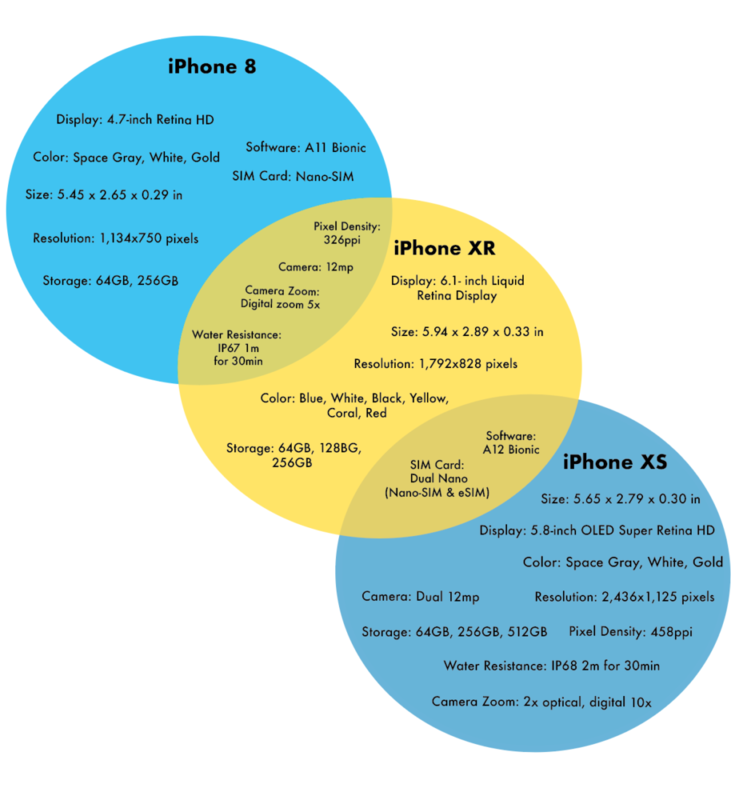 The iPhone XR has a better screen resolution, larger screen size, and dual-SIM capabilities. The battery is also reported to last 90 minutes longer than the 8 Plus. There are also some extra features in the front-facing camera’s ability to take portrait mode and add effects. The iPhone XR didn’t receive the same makeover as the XS, but it’s definitely better than an iPhone 8. The biggest difference between these new iPhones and their predecessors is in the new A12 Bionic Dual Neural Engine processing chip. Apple states that it is 15% faster and 40% more power-efficient. For an average user, this probably doesn’t mean much. The previous A11 chip had processing speeds that could pretty much handle everything you threw at it. However, if you are a gamer, the new A12 bionic chip is giving game app developers the ability to create more immersive experiences. The A12 Bionic can reportedly run the Core ML nine times faster while only using one-tenth the energy compared to the A11. This allows developers to run more things more often without hogging up the GPU with detailed graphics. There is more performance power for developers to tap into when creating mobile apps. This new machine learning framework is allowing developers to not only create high-quality graphics but also incorporate more AI technology. The Core ML is advancing AR experiences too. Developers can custom calibrate sensors in the camera for realistic graphics and lighting. The ARKit2 allows for multiplayer AR games so you can battle your friends right on your dinner table. You now have the ability to accurately measure the size of objects, like your couch, with just your phone. Lastly, the ARKit2 allows you to bring 3D animated objects into the real-world, like trying to see if a new espresso machine will fit on your counter. A few mobile app development companies have already implemented these new features into their products. During the Keynote, Apple had three mobile game development companies showcase how they are taking advantage of the new A12 Bionic chip. Bethesda Games announced their new game “The Elder Scrolls”: Blades. CEO, Tim Howard, gave promising words of “console-like experience” with detailed graphics and stereo sound effects. The new chip will be able to handle these high-end graphics without any lag time. Bethesda didn’t forget about their Android users, Blades is being developed for them too. With these new features, it is not to say that having an iPhone XS will be able to deliver a gaming performance Snapdragon 845 cannot. Simply the iPhone XS just might provide a better experience since the game was developed with the XS capabilities in mind. Atli Mar, CEO of Directive Games, announced how they are bringing augmented reality into their multiplayer games. They are making it possible to battle your friends on your kitchen counter or living room and use your surrounding to your advantage. Apple’s new ARKit2 combined with iOS12 take advantage of the iPhone’s hardware in order to create a more immersive gaming experience by bridging the game world and yours. As of right now, this game is only being developed for iPhones with the AR multiplayer experience. Another app introduced was Homecourt by Nex Team. This app takes advantage of the artificial intelligence capabilities by tracking your movements with only the camera and giving you deep statistical analysis of your performance. The A12 Neural Engine’s power and single image processor can analyze and enhance camera shots in real time with AI. While other smartphones with Snapdragon 845 have AI capabilities the Homecourt app is only being developed for iOS devices. Although two out of the three apps released only favor iOS devices the new technology does not seem to have a substantial impact on cross-platform development. We won’t know exactly what issues could arise until developers get their hands on the chip and unlock its potential powers. If you consider yourself an early adopter, you’re probably itching to get your hands on this new phone. Mobile application developers have already started to take advantage of the new features by creating more immersive app experiences. As technology keeps progressing who knows what the next iPhone will be capable of. Apple raised the bar on wearables with their new Series 4 Apple watch. With the bar set so high they officially discontinued Series 2, 1 and the original, reducing your choices to two: the Series 3 and 4. Upgrades to the display screen size allowed Apple to create a whole new UI design. The display can now show eight customizable app configurations, so you can see more with just a glance. The new haptic crown enables users to feel the movement as they scroll, creating a more pleasant navigating experience. Apple also added some more advanced health features such as fall detection. If a user falls, the watch will send a notification that must be answered within 60 seconds. If the notification is unanswered, the apple watch will immediately contact emergency services. Impressive! 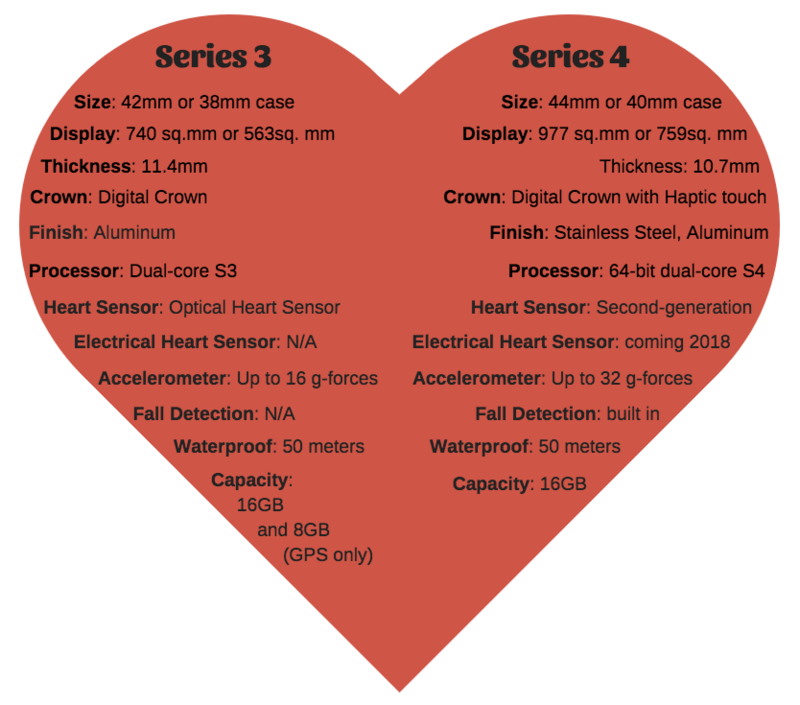 The most talked about improvement to the new watch is the built-in electrocardiogram (ECG). Apple built electrodes into the crown and back of the watch that works together to read your heart’s electrical signals. In 30 seconds, the ECG app will give you a reading of your heart rhythm indicating whether it was irregular or sinus (normal). This technology can be very beneficial to people that have atrial fibrillation or Afib as the watch can monitor their heart rate without having to go into a doctor’s office. It can also benefit people that are unaware they have an irregular heartbeat. The watch also has the ability to create PDF reports of your ECG scans. Ivor J. Benjamin, the President of the American Heart Association, came on stage to support Apple’s efforts in integrating an ECG into the watch. He spoke about how having these heart rhythm reports can provide deeper insights to doctors because sometimes patients come in describing symptoms they aren’t showing at the time of their appointment. Although approved by the FDA as a Class II medical device, there are some cardiologists questioning the widespread use of electrocardiograms by average consumers. These users may not be properly educated about ECG’s. Naturally, heart rhythms vary, meaning that a healthy person could use the ECG and be shown results of an irregular heartbeat. If these false signals happen to multiple users, doctors could wind up facing a crowd of concerned patients wanting unnecessary tests. All medical concerns aside, Apple has stepped up their game (once again) this year. The Series 4 Apple watch’s larger display, slimmer body, improved sensors, updated processor, and advanced health technology has me sold on it. The rapid advancements and level of innovation that Apple offers keep its customers on their toes. Apple has created this culture of product-centered design. We no longer know what we want, but Apple continues to impress us with products that we can’t let go of. The power of Apple is immense…a large majority of us have trained ourselves to rely on their software and hardware to accomplish the simplest of tasks. If you are looking to take your mobile application to the next level, partner with a mobile app development company who knows how to stay on top of the latest releases. Here at Seamgen, we combine our ten years of experience and our expertise to utilize the latest technology in order to create state of the art custom applications.